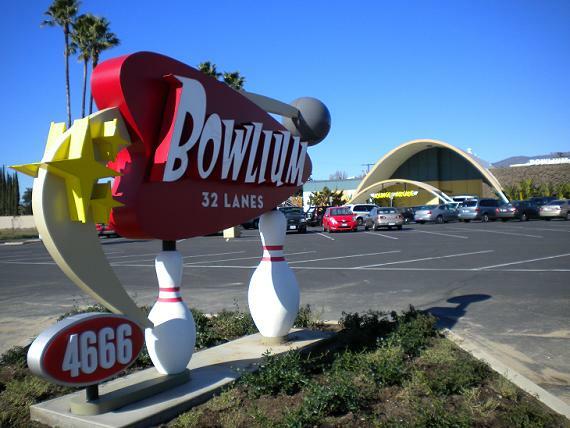 Montclair’s Bowlium Lanes opened in 1958 at 4666 Holt Blvd., just west of Monte Vista Avenue, and the oldest surviving bowling alley in the Inland Valley is still setting ’em up. The 32-lane bowling center recently gained a new, snazzier sign (see above). It’s a far cry from the astonishing sign (see below) that lured motorists from 1958 until its demolition in 1999, but it’s better than the two bland monument signs that filled in in the interim. Friday’s column (read it here) has more about the signs and also about Shakey’s Pizza down the street, Montclair’s oldest restaurant. This entry was posted in Bowling by David Allen. Bookmark the permalink. Wow – cool article. 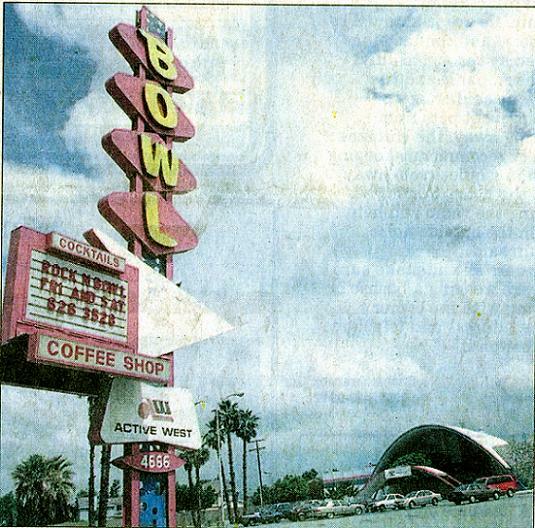 Being a relative newcomer to the 909, I wasn’t aware of Bowlium’s tremendous old sign. Though obviously a step or two down from the majesty of the “BOWL” tower, the new one does a nice job of harkening back to days gone by. Will have to stop by to see it in person (and chuck a few balls in the general direction of some pins) in the near future. You’re quite right David, the original sign was by far the best. But then Montclair has not been blessed with the best and/or the brightest when it comes to making decisions that impact the community in general. The previous owner, Charlie Kinsler, a very successful businessman with a string of bowling alleys in So. Cal, had wanted to refurbish the old girl to a retro look but could only do with his property that which the city government would allow him to do. These are indeed small people with small ideas and seemingly petty agendas. Therefore one cannot expect more than less, sadly. The new owners are from Ventura, have a different management style, and are fantastic at what they do. It will be interesting to how long it’ll take for the City of Montckair to run them down as well.